Before Tropical Storm Chan-Hom made landfall, the RapidScat instrument aboard the International Space Station measured its waning winds when it was moving over the Yellow Sea. On July 11, Tropical Storm Chan-Hom skirted the coast of China near Shanghai and moved into the Yellow Sea where the RapidScat instrument aboard the International Space Station measured its sustained winds. 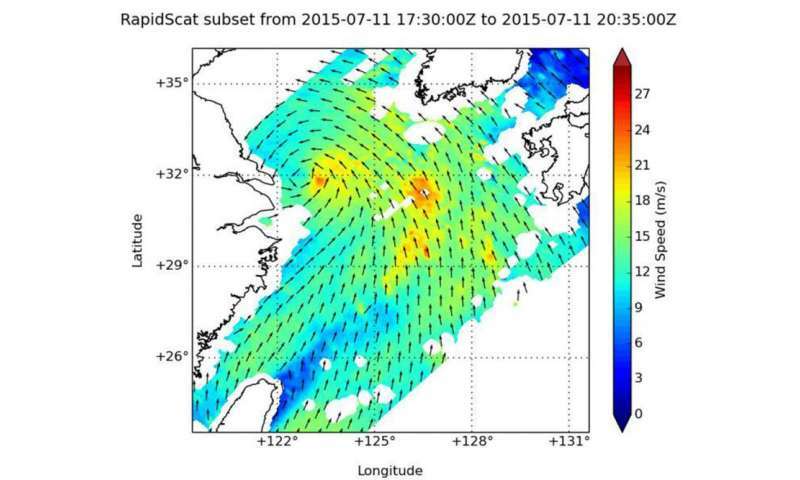 RapidScat saw the strongest winds on the eastern side of the storm near 21 meters per second (75.6 kph/46.9 mph). At 1500 UTC (11 a.m. EDT) today it was centered near 26.8 North and 124.7 East, about 100 nautical miles west-southwest of Inchon, South Korea. On Sunday, July 12 at 2100 UTC (5 p.m. EDT) Tropical Depression Chan-Hom made landfall just south of Pyongyang, North Korea, approximately 78 nautical miles northwest of Inchon, South Korea, near 39.2 North and 126.1 East. The depression was moving to the north-northeast and had weakened to a remnant low pressure area. It is expected to dissipate by July 14.